This is my 50th Christmas with my married family so I began thinking about my time with everyone and what they each mean to me. To honor those who have been close to me without even the thought of expecting anything from me on any level, I decided to send each of them something from my personal jewelry or that of my deceased husbands. I want them to know how much I love them and how much richer they have made my/our life by being in it. Spirit taking me deeper into the love I feel for all of my close and extended family, deeper into my heart and soul to experience and appreciate the beautiful qualities of each. I want you to have something tangible for when Bill and I are both gone. 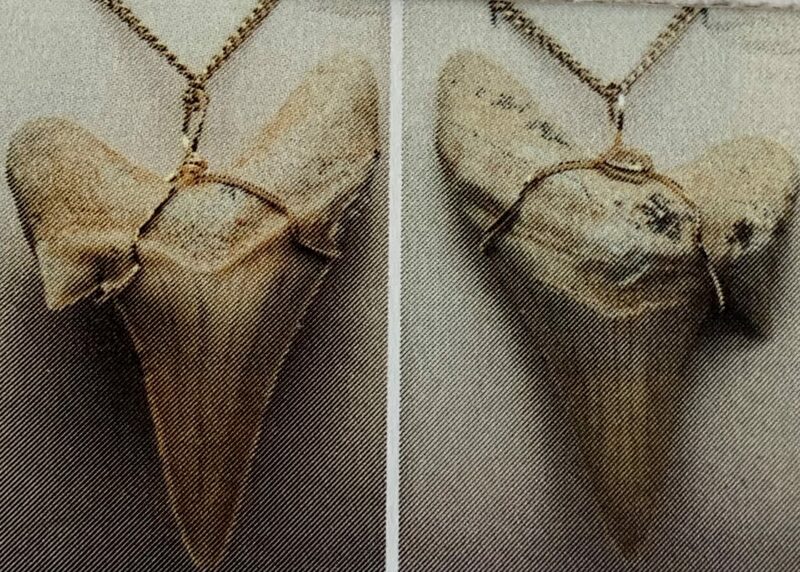 I am passing on Bill’s Shark’s Tooth (fossilized) Necklace with a 14K cable link chain. He loved different fossilized animals, such as ammonite and shark’s tooth. He was particularly drawn to this Shark’s Tooth for its unique features and that it was present on the Earth in eons past. He loved the energy of long-ago periods as he was an old soul probably living during those times. He wore it around his neck when we would travel or when he wanted the energy of the ocean. After Bill died, I had it appraised in 2014 and have enclosed a copy of the appraisal. Bill and I lived a unique life unlike most other couples. On March 13, 1968, I met Bill for coffee (he had cocoa as he didn’t drink coffee) in the cafeteria of the Federal Building in downtown Los Angeles after a fellow Police Officer asked me if I would like to meet him when I was walking across the street to Union Station where I parked. The Los Angeles Police Department and the Federal Building were across the street from each other. We shared stories about our lives to that point and it was easy for us to talk. He asked me for a date a day later and I said why don’t you bring the children over to my apartment for hamburgers. He had custody of the children at that time. He did, and we saw each other most every day until we were married. I was a Personnel Staffing and Employee Relations Specialist, GS-9 and was later promoted to a GS-12 for the US Army Corps of Engineers. He was a Los Angeles Police Officer, working a split shift in the Traffic Division, Parking & Intersection Control in downtown Los Angeles and he had a business on the side. Bill asked me to marry him three weeks after we met, again three months after we met, and again in August when I said yes. My hesitation was that I did not know him well enough, know if I could handle a man with three children as he had the children at the time, plus an ex-wife, and if I knew my own feelings well enough as there was a lot to consider to marry into a ready-made family from a single life. He was such a”romantic”; he proposed to me with an engagement ring on the Garfield Avenue on-ramp to the 10 Freeway headed East. It makes me smile now as he so wanted me to say yes and get married. At the time I was wanting a candlelight dinner in a restaurant by the ocean. He was a practical, down-to-earth man which I valued greatly. He was 40 years old and I was 28 years old when we married in the Oneonta Congregational Church in South Pasadena and where his Memorial Service was held. We began our life together there and honored the end of it there. We were married for 45 years and together for 46 years, had challenges as does every couple, but overall had a wonderful life together filled with family, friends, traveled in the United States and to many foreign countries, had experiences most people do not have in their lives. The greatest joy toward the end of his life was our creating Sacred Healing, LLC, where we healed together. Bill was born July 13, 1928 and died June 3, 2014, he was almost 86 years old. I was born November 12, 1940 and am 78 years old. Bill always liked you as a boy as you were rambunctious, fun-loving, and yet solid in who you were. I loved you the first time I met you as you were full of mischief and had a zest for life that I loved to watch unfold. It was so much fun to have you and your family over to our home, to go to your folks’ home for hot dogs, hamburgers and a swim, to stop to see you in Susanville when we went through, have you come for our 30th Wedding Anniversary Party in Bella Vista, for Bill’s 80th birthday in Burbank, for my last birthday, lunches, and for many other occasions here in Auburn and Southern California. We felt, and I feel a closer connection to you because of your open heart and loving ways. We observed you go through the peaks and valleys of life with courage, strength, and a value of family that surpasses most men. Your determination and perseverance in loving your children through their ups and downs is a credit to the beautiful spiritual being you quietly are. You and Bill shared many of the same experiences with children. Your career dedicated to doing work most others do not have the courage to do reflects the high quality of character, inner stamina physically, mentally, emotionally, and spiritually, and the deep love of humanity that you possess. Your love of nature touches me as I love it also in a way that others do not; it is sacred to me in all its beauty and variety. Your athletic ability with your hiking, kayaking, biking, and other sports reflects your love of all that life has to offer and the zest with which you continue to live your life. The way you take care of your home and property in such a pristine manner reflects a respect for all that you own and the work it took to get it. You honor life in all its forms with the high quality of your giving. Your kind help when I moved in, and your offers of help since I have been here in Auburn touch me deeply and are greatly appreciated. Knowing you are close is a comfort and delight for me as I enjoy your company and your wife’s. You are an incredible man with a depth that is not obvious, but with a sensitivity that is reflected in your love of your Father, your wife, your brother and sister, uncle, your children and grandchildren, close and extended family, and friends. Thank you for your generous spirit and your exceptionally fine qualities as you make my world, and the world a better place. The history of sharks goes back a long time. But the term “a long time” doesn’t even begin to cover it. Let’s put it this way: dinosaurs lived during the Mesozoic Era, which began about 245 million years ago. Sharks, on the other hand, were living on the planet 200 million years before dinosaurs! Sharks are without a doubt one of the oldest creatures this planet has ever known. During the Paleozoic Era, there was a period called the Devonian Period. The Devonian Period was first studied with a Devonian red sandstone found in an area called Devon, England; this is the reason why the period was named Devonian. This period is known for the development of thousands of ancient fish species. Interestingly enough, during these early stages of fish development, they did not have jaws, and their bodies were comprised of cartilage, like the modern-day shark. Sharks also developed during this fishy period of earth. They are believed to be descendants of Placoderms, a group of ancient, jawed fish that possessed a dermal skeleton. Placoderms had what is considered armor covering their bodies. Although sharks are identified as descendants of this group, over time they have lost the ability to produce bone both internally and externally. The shark fossil records show that the earliest sharks began developing during the middle of the Devonian Period. Shark teeth are embedded in the gums rather than directly affixed to the jaw, and are constantly replaced throughout life. Multiple rows of replacement teeth grow in a groove on the inside of the jaw and steadily move forward in comparison to a conveyor belt; some sharks lose 30,000 or more teeth in their lifetime. The rate of tooth replacement varies from once every 8 to 10 days to several months. In most species, teeth are replaced one at a time as opposed to the simultaneous replacement of an entire row, which is observed in the cookie cutter shark. Tooth shape depends on the shark’s diet: those that feed on mollusks and crustaceans have dense and flattened teeth used for crushing, those that feed on fish have needle-like teeth for gripping, and those that feed on larger prey such as mammals have pointed lower teeth for gripping and triangular upper teeth with serrated edges for cutting. The teeth of plankton-feeders such as the basking shark are small and non-functional. Special mention: Megalodon teeth: Megalodon teeth are the largest of any shark, extinct or living, and are among the most sought-after types of shark teeth in the world. This shark lived during the late Oligocene epoch and Neogene period, about 28 to 1.5 million years ago, and ranged to a maximum length of 60 ft. The smallest teeth are only 1.2 cm (0.5 in) in height, while the largest teeth are in excess of 17.7 cm (7.0 in). The smaller teeth ranging from 3½” and 4½” are more common finds, while teeth over 5″, 6″, and 7″ are more rare. These teeth are in extremely high demand by collectors and private investors, and they can fetch steep prices according to their size and deterioration. The larger teeth can cost as much as 3,000 dollars. So, I pass this on with all the love Bill had for you and the Shark’s Tooth, I had for Bill, and that I have for the good man you are. May it enfold you in the greatest love and protection now and forevermore. Merry Christmas, _____. This man called me immediately after he received this, first to check to make sure I wasn’t leaving the Earth anytime soon, then to let me know he was deeply touched by this surprise gift. He said he would treasure the letter and gift as long as he lived. He also told me that although he did not have a bucket list, if he did, one of the things that would be on it was to see a Great White Shark. There are no accidents as to why I selected a Shark’s Tooth to pass onto him. Spirit guided me to pass on to him the gift that would be the most meaningful to him, that would touch his heart in the deepest way, and provided the words that would mirror to him the exceptional man he is.